Base training is a very important part of preparing for a running event. Building and broadening your base helps to create the proper foundation to facilitate movement into the core training phase – preparing the body to perform the workouts required in peak training, and aiding in injury prevention. This week’s 85 miles of training wrapped up Base Badwater Training, and after a day of rest today, Peak Badwater Training begins. Training for this week included a fun 26.2-mile run with Brennen W. at Rockefeller State Park. Brennen and I used to get together on weekends in the Hudson Highlands before he joined the fatherhood club. It was good to see him back in action. 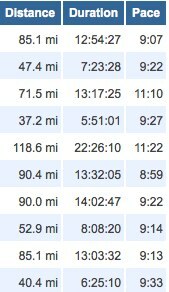 9:09 AM – 10.00 miles in 1:24:29 (8:26 pace). Goal was to hold around 8:00 pace for first 4 miles, 8:00-8:30 pace for next 3 miles, and 9:00 pace for final 3 miles. 6:46 AM – 26.20 miles in 4:10:47 (9:34 pace) with Brennen W. at Rockefeller State Park. 6:27 AM – 18.20 miles in 2:53:31 (9:32 pace).